Over 1600 families came via many bus lines or on foot from the hills and dumps to attend an early morning Mass. Some even arrived the night before and camped out in the street. The mission of the Casa is to glorify God through the works of mercy. The people did indeed glorify God and the Holy Family by their thankfulness and joy as they happily received their food, blankets, and a toy. A breakfast of cocoa and hot cinnamon buns was served to those waiting in the long line to receive the gifts. The patio was decorated for Christmas and a live Manger scene was created by bringing two or three animals from the City of Mercy Mental Hospital in Rosarito Beach. Humble men and women stood in line for hours to receive a bag of beans, rice, oatmeal, sugar, tuna, canned milk, and fruit. They were thrilled and grateful to receive this food and the other gifts. You made Christmas a time of JOY for our brothers and sisters in Christ who endure harsh poverty in the dumps of Tijuana. Your generosity provided 1,600 bags of special food and a new blanket for 1600 families. The people were delighted to also receive oranges and apples in their bag of treats. In December, we received $50,884.31 from our regular donors for both monthly and Christmas help. This was double from last year! We received $69,298.80 (total for both November and December) from our special Christmas appeal letter and other donors. That includes $37,806 from All Hallows Church Advent collection and the special letters. This money purchased the food (chickens and shoes were donated) and blankets. Thank you everyone! 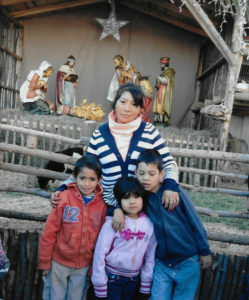 Our check to Sister Armida this month will buy MORE BLANKETS, TARPS, food, and essentials for January. 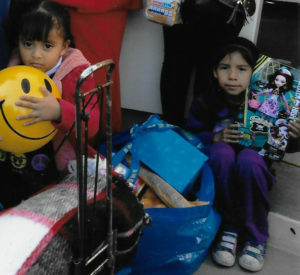 Words cannot convey how much we appreciate your generous giving and love for the poor in Tijuana who come to the Casa. The Sisters and people are grateful for your support and pray for your intentions daily. The need is never-ending as you know by now. 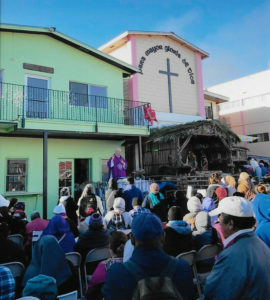 The Franciscan Sisters have been serving the destitute in Tijuana since 1957 through their soup kitchen, bodega (food pantry), roperia (clothing closet), medical clinic, and social service office. They reach thousands each week through their apostolate of LOVE — serving JESUS in the poor. We have NO overhead, except minimal PayPal and credit card charges. This entry was posted in December 2017 by Pat Erzinger. Bookmark the permalink.